Jas. 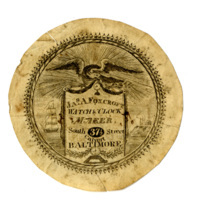 A. Foxcroft watch & clock maker 37 1/2 South Street Calvert Baltimore. 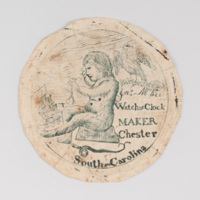 Engraved watch paper with image of an eagle holding a banner and watch with a clock at bottom. In the background is a view of a ship. 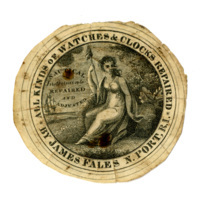 All kinds of watches & clocks repaired by James Fales N.Port, R.I. Nautical instruments repaired and adjusted. 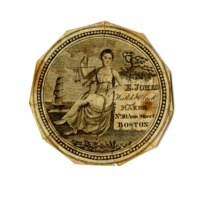 Watch paper with circular border and image of an allegorical female figure, Justice, holding scales and a sword. A ship is seen on the water in the distance. Wm. 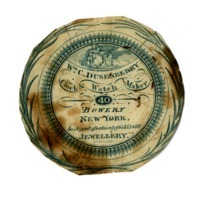 C. Dusenberry clock & watch maker 40 Bowery New York. An elegant assortment of gold & gilt jewellery. Includes decorative border with branches. 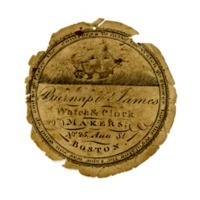 Includes image of a ship. Printed in blue ink. 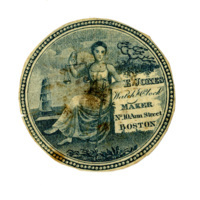 Includes decorative lined border with text running around it. Central image of a ship at sea. "To make the watch go slower turn the regulator the same way you wind up and to go faster the contrary." Line-engraving. 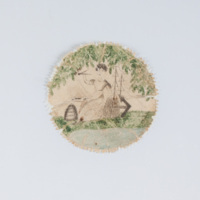 Crude figure of large seated child, holding small watch with fobs on chain. Small ship in background at left and eagle at right. Snake biting heel of child. Lined border. Blue ink on paper. Line-engraving. 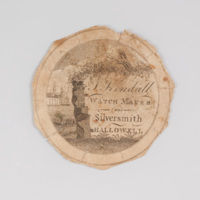 Pile of rocks and foliage frame watchmaker name and address. Buildings and ship in background on left. Lined border. On paper. 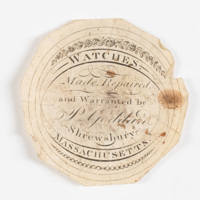 Watches, made, repaired and warranted for by P. Goddard, Shrewsbury, Massachusetts. 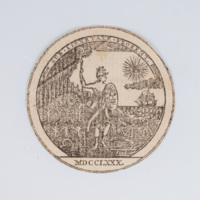 Engraved watch paper with floral decoration.